Aboard RAVEN after long, beautiful day in the air and airports. See tweets for some photos of travel. Near disaster when I took the wrong train to San Francisco International, an error not realized until I was at the bitter end of the line. Note to self: don’t doze, even it if is 5AM. Ran with my 40 pounds of toot to a cab. Made it with 5 minutes to spare. Other crew member has missed his flight altogether, so we are delayed by two hours in our departure this evening. We head out at 8PM for Bull Harbor, north and west by 20 miles, there to spend a short night at anchor and then up well before daybreak to hoof it on slack out around Cape Scott. We’re eager to get below this promontory before strong SE winds develop on Thursday. Winter Harbor is the goal by tomorrow night. That will be a long, 60 mile day. Kurt has made dinner of cheese fajitas; have had a beer. We’ve studied charts; I’ve got a tour of the boat. Excited to get underway. Departure also means the end of WIFI. It’s most likely that further transmissions will be via the boat’s primitive SAILMAIL account and maybe not for a day or two. Sailing is like riding a bike: once learned you never forget. That said, my Figure 8 attempt, now a mere year and two months off, isn’t just any old bike ride. It’s more like a motocross stunt performed over and over again for months. I need to keep my skills up. To that end I agreed some time back to help a friend deliver his cruising sailboat, a fast and sturdy Westsail 39 named RAVEN, down the coast of British Columbia’s Vancouver Island. We’ll start in Port Hardy, on the island’s northeastern tip, transit up and over the top, through the treacherous slop of Nahwitti Bar, around notorious Cape Scott and on down into the rugged cruising grounds of windward, western Vancouver. Though all coastal sailing, all if it will be exposed to the Pacific swell and weather. And we’ll start tonight. I’m writing this from Vancouver Airport’s South Terminal. Small and separated from the commercial hub by a ten minute bus ride, the terminal is situated on an estuary abuzz and serves the float planes and other propellored craft that ferry passengers to the unknown north. The blue of fir trees all around. Snowy peaks to the east barely visible through the deck of cloud, but west the sky is clear. The soft wind is warm and humid. I am in a t-shirt. Most locals are in shorts, and their alabaster legs suggest the rarity of days like this, suggest I may not have, in fact, over packed. It took till 1AM to clear the gear cluttering the living room these last days into one large duffle and one small pack, 30lbs in all and mostly clothing. My packing list included heavy foul weather gear, lighter waterproof jackets and pants, light, medium and heavy weight thermals, three pairs of wool-tech socks, heavy rubber boots with wool liners, rubber fisherman’s gloves and four pair of woolen inserts, a light and medium weight fleece hat, and one fleece “helmut” resembling the cold-weather hood worn by Shackleton in the Antarctic. Could be this is taking preparedness to an extreme. But I remember being cold in Alaskan waters in August. And some of this is gear experimentation. The Shackleton hoody, for example, is a recent acquisition whose genius is that it not only covers the head and ears completely, but it also protects the neck. It might be a design well sooted for my high latitude year. The same goes for a GoLite down jacket whose treated feathers are said to be highly water resistant. Early tests in San Francisco Bay drizzle suggest this is the case, but real rain here is likely, providing a much better test. The captain’s name is Kurt. We first met in Mexico in 2010 where he was cruising the Sea of Cortez on RAVEN, this when I was there on MURRE, and we have recently become reacquainted as I explored the Westsail 39 as a potential Figure 8 boat. The last two months have been all boat search with this boat being but one of about ten great candidates. But Kurt was quick to disqualify the W39. “Too many windows,” he said. “You’re going south. Think inverted. What the f*ck if one of those pops out. In fact, you wouldn’t catch me down there in anything but those fat, French aluminum tanks.” Such comments to one side, the W39 is a solid Robert Perry design, nimble, stiff, sure-of-foot, and I’m excited to see how she does out in the open. The cruise is designed to last until July 4th and terminates in Victoria. During that time my communications will be much the same as those during my ocean passages on Murre, that is frequent but all text. There are few towns along western Vancouver and less internet. So, I’ll be using RAVEN’s SSB to send messages to this site. My flight boards in ten minutes. Time to get a coffee and a chocolate chip cookie. Note: this is a follow-up to my Murre and the Pacific cruise of French Polynesia. In 2011 I explored French Polynesia on Murre and was only a month departed from the Marquesan Island of Nuku Hiva when I learned a recent tragedy there had been attributed to cannibalism. Murre rode her anchor in Opunohu Bay off Moorea by this time, an island some 1000 miles further west, where I met a couple named Hannas and Christine aboard Pukuri. They had made Moorea before me, but suddenly returned by air to Nuku Hiva. 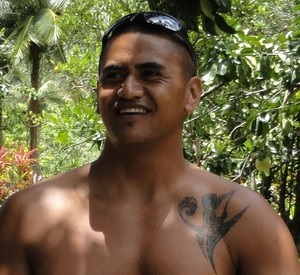 Returning to Moorea a week later, they told me of the terrible fate of their friend Stephan Ramin. Like Hannas and Christine, Stephan and his girlfriend were slowly island hopping through French Polynesia on Baju, but were behind Pukuri’s track. The two couples became friends in Mexico but had soon separated, each choosing to take different and wandering paths through the Pacific islands. Baju was enjoying Nuku Hiva while Pukuri and crew explored Moorea. One day Stephan hired a local on Nuku Hiva to take him on a private goat hunt. Wild goats are common on the islands, and they are frequently hunted for food. Stephan and his guide took off for the forest in the morning. That evening the guide returned to Baju alone and with an urgent message for Stephan’s girlfriend. Stephan had been injured in the mountains and the guide needed her assistance. The girlfriend found this story suspicious; she refused to go. The guide tied her up, threatened her, and then left. After some time she freed herself and ran to the Gendarmes. A search for Stephan began. Based on the girlfriend’s description of the guide, the Gendarmes had a suspect. They visited the suspect’s farm, and though they did not find him, in an outdoor oven they found the charred remains of a human body, later identified as Stephan. Cannibalism was suspected. The story exploded. Overnight it hit the European tabloids. Stretches of Marquesan history are violent in the extreme. Severe overpopulation prior to Cook’s arrival in the 18th century caused competition for food and land, and cannibalism during this period was apparently common among the warrior and ruling classes. But European contact all but eliminated the practice. Western diseases like syphilis and influenza decimated the Marquesans; those that remained were aggressively Christianized by white settlers. Cannibalism vanished. Slowly rebounding contemporary populations are under the control of a benevolent though strict French socialism. In the outer islands, there are few jobs, but welfare supplies the money and the islands supply the rest. An odd effect of this is that a surprising number of Marquesans can drive Range Rovers, but access to bullets (for goat hunting) is tightly controlled by the Gendarmes. The result is that crime, real crime, is unheard of. The cruiser passing through simply does not worry about things like theft, assault, piracy … cannibalism. Hannas and Christine flew back to assist with the terrible aftermath of Stephan’s murder, comforting the girlfriend and the parents who had flown out, cooking meals, dealing with the boat. They were wiped out and heart-sick when I met up with them, deeply saddened by the loss of their friend and for a conception of paradise that had been shattered. In recent years, native island councils have begun to resurrect their ancient traditions by way of connecting with their past and instilling a sense of pride in a decidedly listless younger generations. Young male islanders, it was said, had taken this a step further by secretly reverting to cannibalism as an initiation rite. The victims were not locals, but cruisers. Every once in a while a visiting yacht that had been at anchor here or there went missing, later to be washed up on a reef; its crew, also missing, assumed drowned. The events were written off as mishap, but not now. For the French government this murder had gone from unusually serious crime to public relations disaster. Investigators from both France and Germany soon arrived. The islands were abuzz. But I soon sailed on, leaving the story behind, and am only returning to it now because, nearly three years after Stephan’s death, the case has finally achieved closure. Surprisingly, the suspect, a 33-year-old male by the name of ArihanoHaiti, eluded capture for 50 days, quite a feat on such a small island whose population struggles toward 2,000. At his trial he asserted that he shot Stephan because Stephan had sexually assaulted him and that he later assaulted the girlfriend out of revenge. The court did not buy this story and just yesterday sentenced Haiti to 28 years on jail. Interestingly, the court also found that investigators were unable to prove cannibalism had occurred. 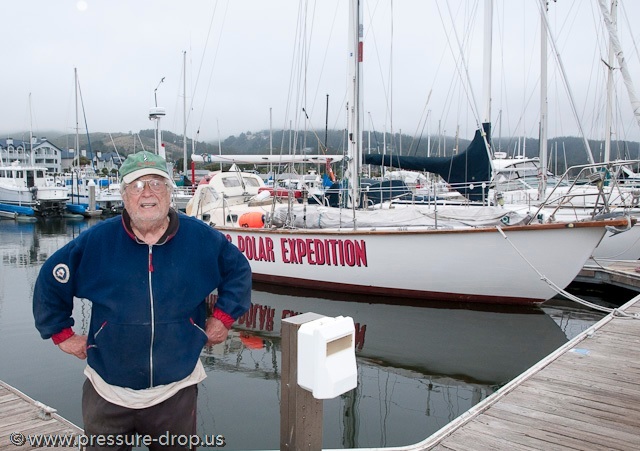 Meet Jerry Borucki, a fluid-dynamicist retired from NASA’s Ames Research Center, resident of Mountain View, California and extreme sailor. 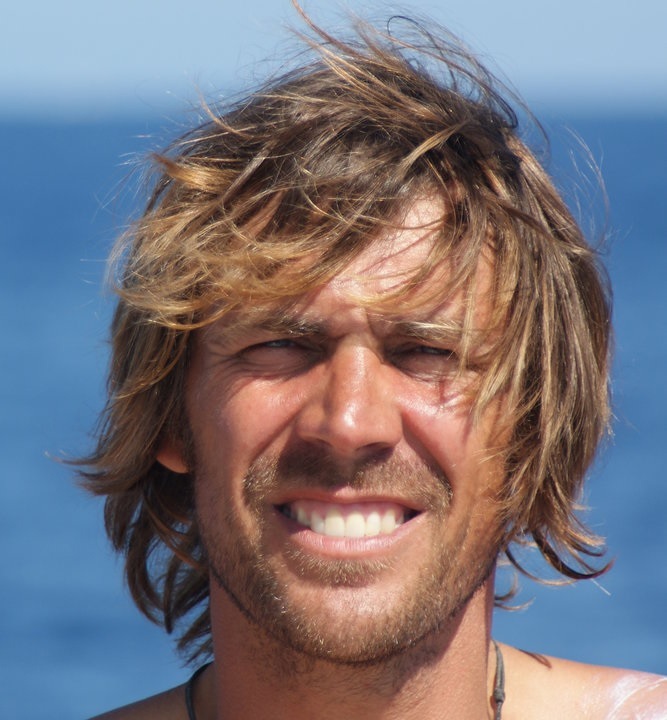 His goal, one he has chased for many summers since 2006, has been to reach the North Pole in a small boat. The beauty captivated him and that was that. The next summer he set out to reach the Aleutians, and the summer after that, the Arctic Circle. A year later he was searching for the western pack ice, which he found at 76 degrees north latitude, 500 miles above his venture of the previous summer. In 2007 he, and now aptly named Arctic Alpha Wulf, were rocked by a full storm and two gales while holed up in uninhabited Nash Harbor on Nunivak Island. Here he waited at anchor sixteen long days for a weather window that would allow his sprint south. He began to run short of food and fuel, and was assisted with both by a tug and barge also waiting. Once below the Aleutians he experienced a gale every three days and a severe knockdown that held the boat on her side for a full five minutes. Surprisingly, damage was minimal–a canvas dodger blown clean off and a swamped stove due to the flu being underwater so long. “It was (rough) enough to knock the sugar out of the coffee,” he said. Again he was waiting for the weather to moderate and allow a departure for home, but each day he waited saw the ice around Arctic Alpha Wulf grow thicker. He began to wonder if escape was possible. Finally on November 14 he decided to make a break for it regardless of the conditions in the Gulf of Alaska. After warming the engine and raising anchor he began to move. A storm in the Gulf blew out his main and he put into Yakutat for repairs, but at last he was free of the Arctic winter, and free to plan his next year’s assault. Voyage Ends, David F. Smydra Jr., Half Moon Bay Review, October 24, 2007. *The Iceman Cometh, LaDonna Bubak, Latitude 38, February 2008, p. 114. Bound for the Pole, Ladonna Bubak, ‘Lectronic Latitude, Latitude 38, August 8, 2008. 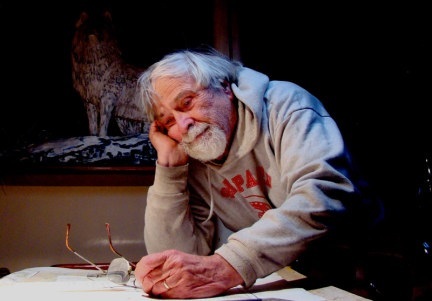 **Jerry Borucki, Jerry Borucki, Latitude 38, February 2011, p. 88. Here we consider the first of several big issues impacting the success of the Figure 8: Mileage and Timing. 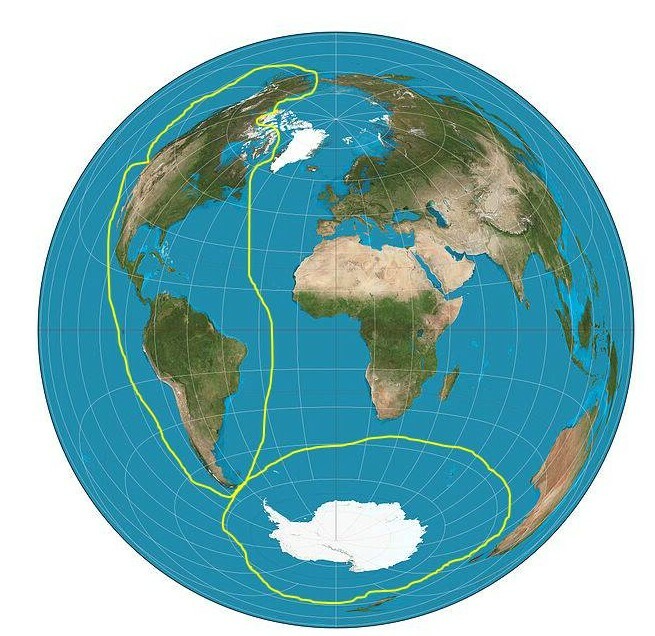 The Figure 8 Voyage consists of two distinct segments, a longish ocean cruise through the Pacific, Southern and Atlantic Oceans, and a tight, harbor pilot’s squeeze through the very constricted waters of the Northwest Passage. Strategies for these two are so different that I’ve considered them separately. Using OpenCPN (free, online chartplotting) I’ve worked up both routes to a high degree of accuracy and the total distance for the Figure 8 comes out to … drum roll please … roughly 40,000 nautical miles. Think San Francisco to New York; now repeat nearly ten times. Compare the circumference of the earth at the equator: a mere 26,000 miles. Those two routes are captured in the following graphics. The first is all “blue water” sailing. From San Francisco I shape a course south through the Pacific, jogging a bit east above the line so as to gain some purchase against the southeasterly trades below. Having rounded the Horn, I quickly climb back to the 40th parallel where weather should be less severe and where I will attempt to spend the majority of the Southern Ocean passage. Having rounded the Horn for the second time, I begin to work up the Atlantic, staying west of both the south and north Atlantic high pressure systems before entering the arctic circle to the west of Greenland at 66.5 degrees north latitude. This routing is based entirely on prevailing wind patterns in particular quadrants of ocean at particular times of year (more below). If the above is concerned with navigating large weather patterns over huge stretches of ocean, the Northwest Passage is an exercise in pilotage. Here wind patterns matter little if rocks get in the way, and so I have based this segment entirely on what is now called the Amundsen Route, named for the previously-mentioned explorer who first completed it. In fact, this is only one of several possible waterways through the arctic, but for planning purposes it is a worthy place holder because it is the longest route, and it is, historically, the most likely to be passable in any given year. This approach hugs the Greenland coast to about 75 degrees north latitude due to extrusions of ice from Baffin Island in summer before passing into Lancaster Sound and then Barrow Strait. Here the course moves sharply south into Peele Sound and then Franklin and James Ross Straits before resuming a westerly course in the very restricted waters just above mainland Canada and then the potentially more open waters of the Beaufort and Chukchi Sea, exit Aleutians near Unimak Island. The distance of the Figure 8 is precisely known. My careful plotting of these two segments sums to exactly 37,726 nautical miles. But I have used the word “roughly” above because though try as I may for conceptual precision, the watery world will most certainly intervene. One example among many: surface winds upon the larger ocean, winds a sailboat requires for its daily motivation, blow in grand, mostly predictable patterns of direction and velocity. 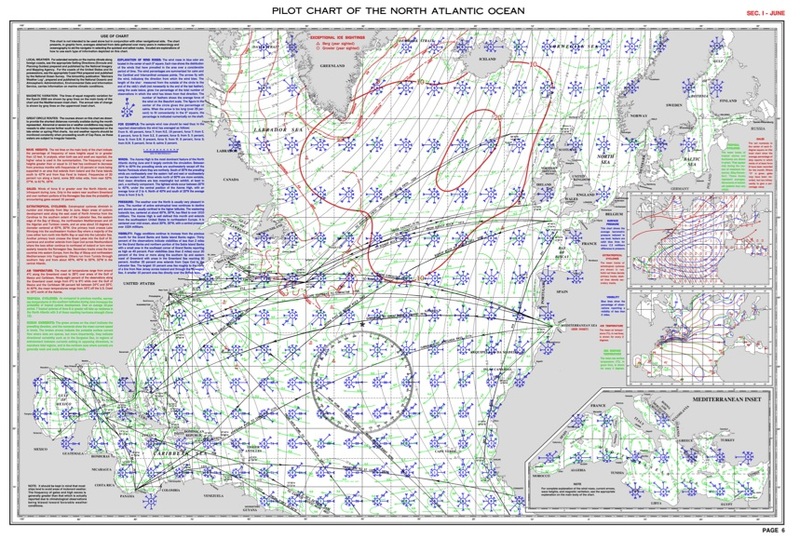 Since the 19th century these winds have been observed, recorded, catalogued and published in wonderfully intricate, absolutely beautiful documents called Pilot Charts (I’ve used Cornell’s Ocean Atlas, by Jimmy Cornell). These charts are summaries of wind and current behavior over every quadrant of every ocean for every month of the year. 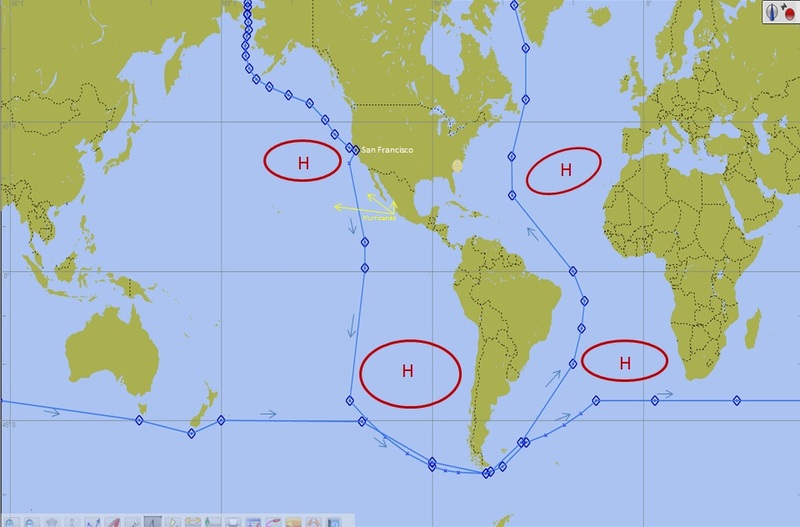 They are the brain child of Lt. Matthew Fontaine Maury of the U.S. Navy who realized, in 1842, that decades of ship’s logs stored in Navy archives contained valuable information on ocean weather that could be compiled into weather charts. More recently cruiser and regatta organizer Jimmy Cornell has put these charts to extensive revision using satellite weather data. As good as these charts are (they are the Holy Grail of route planning), wind where you are at any given moment can blow from anywhere. To their credit, the Pilot Charts attempt to account for this, but sailor’s logs from time immemorial are filled with diatribes against the blasted charts for winds behaving badly and blowing them off course. Upshot: even a carefully planned course planned is not necessarily that will eventually be sailed. I have sought to anticipate these vagaries of wind (and current and wave and rig failure and captain error, etc.) by modeling several possible results. What if my mileage is 5% under plan or 10% over; or 20% over? Of course, if the distance traveled varies, so will the time required to travel it. One unique feature of this voyage is the need to arrive at the entrance to the Northwest Passage (in this case, the eastern end of Lancaster Sound) at a particular time. The northern summer is intense but short. In a typical year, ice thaws into leads and then clear water, if at all, for as little as a month. 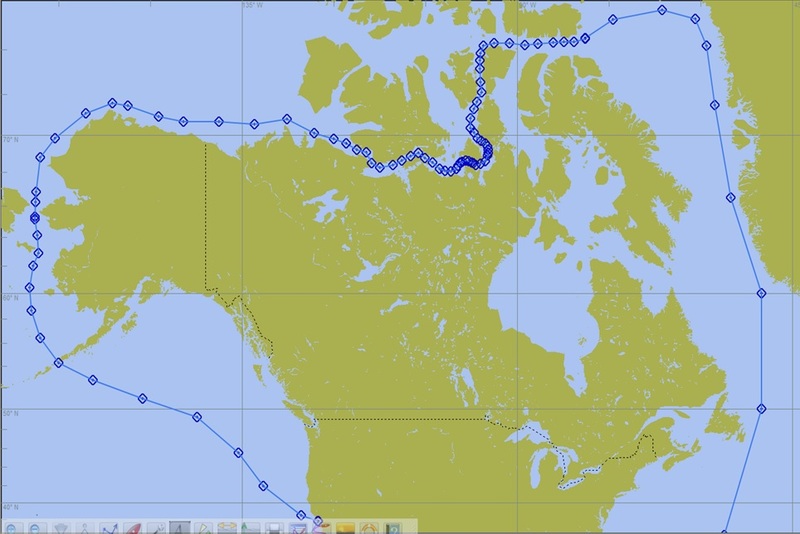 The wise cruiser attempting an east to west transit of the Arctic will want to be in position by the beginning of August and hope the passage opens by mid-month because ice will begin to reform at these latitudes as early as mid-September. That’s in a typical year, of which there is no guarantee. In 2011 and 2012 conditions were right for a passage of this kind, but in 2013, the arctic ice did not thaw uniformly, and in key places it failed to melt at all or refroze early. As many as 20 yachts transiting the Northwest Passage were trapped in the ice. Another timing I will want to pay close attention to is that demanded by the heavy weather in the Southern Ocean, specifically as the route requires two roundings of dangerous Cape Horn. Looked at from the South Pole, the Southern Ocean is a big, watery donut surrounding Antarctica and bordered to the north by South America, South Africa, Australia and New Zealand. Its reputation for storms and massive waves (not to mention cold and the occasional iceberg) is nothing short of legend. Small boats passing through these waters should position their arrival and departure for the height of summer (November/December/January) when gales are at a minimum. Given the difficulties of predicting day-to-day wind and weather at sea, it is highly unusual for sailors to plan an ocean passage with the idea of arriving at a particular place at a particular time. In fact, for many, it’s the open-endedness of such journeys that provide much of the charm. All this means that for the Figure 8 I will need to pay close attention to the boat, not only its sea-keeping abilities, but also its speed. These are considered in some detail in the next post. It is commonly held that excitement is the goal of adventuring. But in truth, excitement is adventure’s potentially enjoyable but often unwieldy result, too much of which can be the death of you. Professionals know this as a matter of course. The sentiment reflected in the title of this post is an aphorism widely attributed to Roald Amundsen, first explorer to sail the entirety of the Northwest Passage in 1905 and 1906. He is often compared to Captain James Cook, not just for his unprecedented successes but also his famously thorough preparations. Sadly, two clues suggest the remark is apocryphal: 1) no citations attend its many instances online; 2) Amundsen’s prose, though clean and energetic, did not easily submit to such concision. Point being, the only way to play the many variables of any big adventure is to have a good plan. I have been going at Figure 8 planning for some time now, ranking not only what must be researched, learned, resolved; bought, tested, and abandoned; relearned, rebought, retested, etc., but also its order in time prior to departure. The Project Plan is up to eleven pages; supporting documents extend as long as my arm and promise to grow by many fold as things progress. There are several reasons to consider these two together. For one, it has been important to prove to myself the expedition is, in fact, possible. Remember the goal: to circumnavigate the Americas and Antarctica solo and in one season. How far is that really? Can a sailboat go fast enough? Can I time the passages so as to be in the dangerous high latitude areas at the best times? 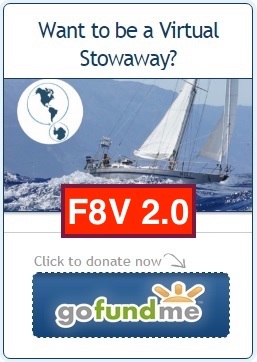 Apart from proof of concept, these items are related because the route, its timing requirements, and the extremes of demand upon the boat (stormy open ocean vs stormy rocky, icy ocean) all work to define the type of boat I’ll need. In the next two posts, I’ll explore these items in more detail. At the recent Strictly Sail show in Oakland, an experienced blue-water sailor and I got into conversation about the Figure 8. I described the loop in the Southern Ocean followed by the Northwest Passage and said I thought the latter was technically the more difficult. But if what I said was wide of the mark, what I meant was accurate. One could argue that ocean voyaging is conceptually similar to trekking long distances over land, the Appalachian Trail, for example. In both cases a plan must seek to balance survival requirements against what can reasonably be carried; where and when one wishes to arrive against how fast can be safely traveled given weather, surroundings and the limits of endurance. Here, steady progress over weeks and months is the measure of success. But my arctic route will be more like climbing a mountain, where focus is minute-to-minute and precision in the placing of hands and feet is needed to master the next ledge and the next after that. For this section of the journey my navigation will switch to pilotage, and I will trade the wide ocean for constricted, rocky, shoally, fog-bound reaches and the negotiation of ice in all its guises. Much of this transit will be made good under power due to a lack of wind or room to maneuver. Instead of thousands of miles between waypoints, I will judge my progress in the tens of miles; some days there will be no progress at all. In this way the Northwest Passage is the more technical of the two routes comprising the Figure 8. And adding to its difficulty is the research, for though there is a vast amount of online resource, there is no single cruising guide for the frozen high latitudes. 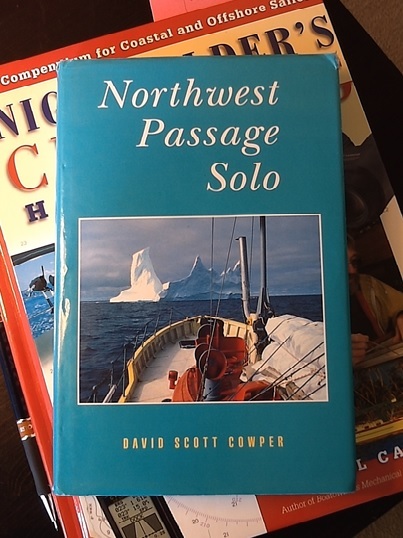 One book that comes close is the instructive and thrilling read by David Scott Cowper, Northwest Passage Solo. Cowper is the quintessential English adventurer, tough, daring, unflappable, understated. By the time he came to attempt the northern route in 1986, he had already set the speed record for soloing the world in both directions under sail. Against this a singlehanded circumnavigation via the arctic, also a first, seemed nothing more than the logical next step. But the arctic posed unique challenges for which this dedicated sailor chose a retired motor-lifeboat named Mabel E. Holland, whose 42 feet in length was so taken up with engine and fuel and equipment there was scarcely space for his bunk. The book is full of misadventure. Mabel E. Holland is ice-bound, rescued by Icebreaker, abandoned by Icebreaker, holed, sunk, and beached for repairs for two winters at Fort Ross on Somerset Island before her escape via the Bering Straits. It is with the reading of Cowper that I feel my Northwest Passage research has begun. 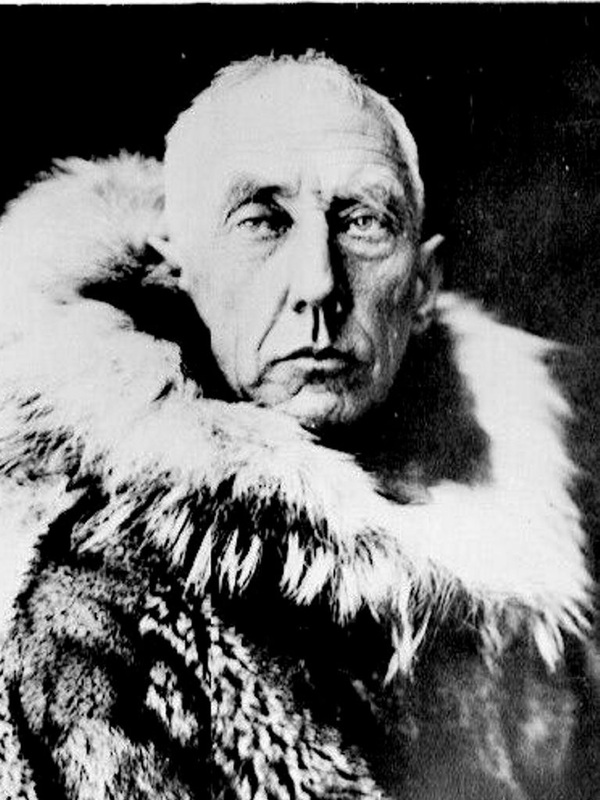 *Roald Amundsen’s account in The North-West Passage (ebook) summarizes his expedition in Gjoa in 1905-06 and is far more detailed regarding arctic survival techniques and ethnography, but lacks the kind of contemporary and turn-by-turn detail useful to those planning similar adventures. **Another great advantage of the book is the detailed (nearly 50 pages) summary of Northwest Passage History. Archimedes lay in his bath, Newton pondered beneath a tree, and Einstein pushed a stroller along the busy sidewalks of Berne–surprisingly mundane activities for the birthing of big ideas. So I take it as fortuitous that my idea came into being while I washed dishes. Maybe water swirling in the sink suggested that a figure eight sailing route around the world, by way of the five capes and the Northwest Passage, held elements of promise. More likely, however, the source was my discovery earlier that day of Matt Rutherford’s story. One could argue that singlehanding is unusual by definition, but even among the odd community that is solo sailors there are those who seek to go one step further. Take Dr. David Lewis or Webb Chiles or David Scott Cowper as three interestingly different examples in a field where difference is the norm. 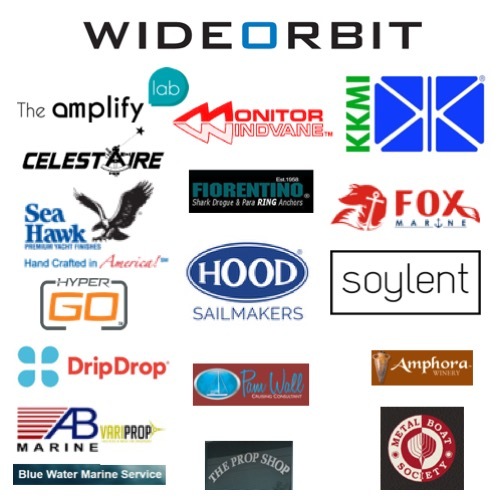 Finding a unique enterprise in such company can be difficult, not to mention the completing of it once discovered. Just so for Matt, who departed Boston in June of 2011 and headed north for a first-ever solo, non-stop circumnavigation of the Americas. Among his challenges were that his boat, a 27 foot Albin Vega he named St Brendan, was too small for such an undertaking (everyone’s opinion but his own). A short waterline made her slow, pushing the time required for the 23,000 mile loop to 11 long, solitary months. Her lack of storage below allowed only dehydrated foods and a hand-pump watermaker. Matt carried no heater because there wasn’t room for it or the fuel it needed. There was almost no safety equipment. Ship’s lifeboats are far larger and better equipped, yet in this tiny capsule Matt successfully took on Cape Horn and transited the frozen north. How he came to his idea I don’t know, but even this radical venture had precedent. Since 1968 and the first non-stop, singlehanded round the world race, 300 solo sailors have left Cape Horn to port or starboard in small boats, conquering what is now often called “the Everest of sailing.” And like Everest, it’s getting crowded down there. But that arctic transit is something else. A hundred years fill the time between Roald Amundsen’s historic crossing of the Northwest Passage in Gjoa in 1905 and the first American yacht’s via the same route because this passage is almost always unpassable. What’s now known as the Amundsen Route is well above the arctic circle, at times a stone’s throw from the magnetic north pole, and shoally or rocky or ice-strewn in those few short weeks of summer when it’s not busy being solid ice. By any reasonable measure it’s a sailor’s nightmare. So, when Roger Swanson and team in Cloud Nine finally pushed through in 2007, he could be forgiven if it took him three tries. But that first began the caravan. 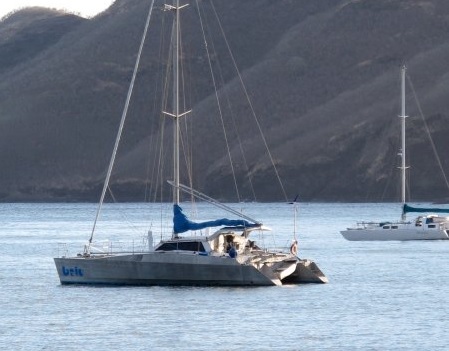 Six yachts under 30 meters made the transit in 2008; ten yachts in 2009; another six in 2010. The word was out. So it was in this context that Matt, while looking around for an interesting, unusual adventure, put two and two together and came up with a loop. Similarly my idea, for I am simply going one step further in knitting together the Northwest Passage with a circuit of the Southern Ocean. Of course, the idea is the easy part. The hard part is convincing the wife. This response should not have surprised me. In 2011 and mid-stride of a one-year cruise of the Pacific in my small ketch Murre I had popped a similar question, extending that cruise of Mexico and Hawaii to include Tahiti and Alaska, doubling my sea miles and time away. Much to the flabbergast of everyone, especially me, Joanna approved instantly. So now the idea is out there and the pursuit has begun. All that remains is everything else.